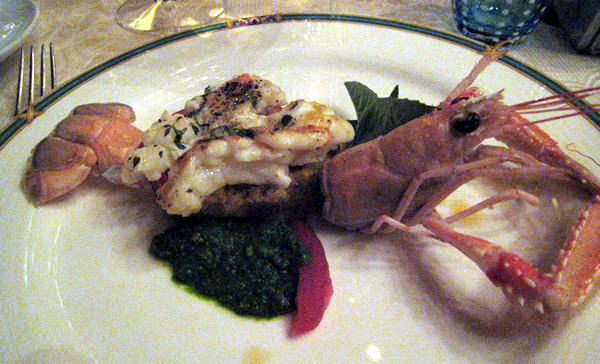 The starter was panzanella di pomodoro con scampi di Fano – tomato and bread with local scampi on a bed of arugula. As chef Lucio explained, this is a recipe inspired by the “fishermen of the hills” – those who, while owning a fishing boat down on the coast, live up in the hills, where they also have enough land to grow their own produce. Because they are farmers as well as fishermen, their cooking combines the flavors of the sea with those more traditionally associated with the countryside. Whatever the inspiration, it was divine. I crave more of that stuffing-like panzanella bread, and would like to explore uses for it in other formats. If memory serves, with it we drank a Gavi di Gavi docg 2005.
dellâ€™Adriatico: penne made from spelt flour with a sauce of local scorpionfish. Sara told me that Latini brand pasta is supposed to be the best in Italy. I was sitting next to Sara’s French husband, Patrice, who agreed with me that he couldn’t really tell the difference between one pasta and another. Several of the Italians at the table stated categorically that there is a difference, but you have to be raised on pasta to appreciate it properly. It was served with tiny sides: the rolled-up things on the left seemed to be sort of piadine (the Italian version of “wrap” sandwiches) with ham and cheese inside. On the right you see three strips of delicately batter-fried fish filet – I would have been happy to eat a lot more of that. 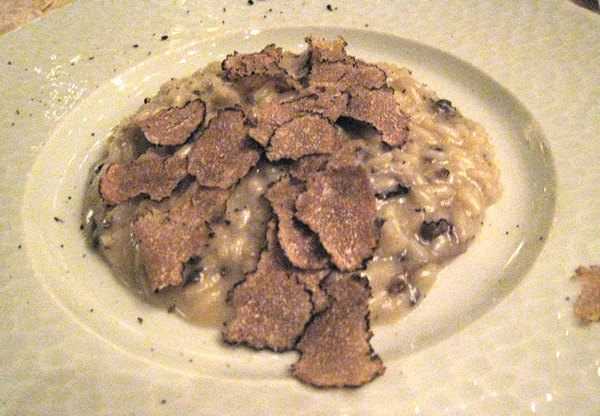 Nero – risotto with sheep’s milk cheese and black truffle (that’s the black-edged stuff you see in slices over the top). I have not in the past been crazy about truffle, and feared this dish would be wasted on me. It was not. It was the best risotto I’ve had in my life, and two of the Italians in the group said that, as natives of regions specializing in risotto, they could testify that this was “un risotto come si deve” (risotto made the way it’s meant to be). Wine with the pasta and risotto was Vernaccia di San Giminiano docg 2005. 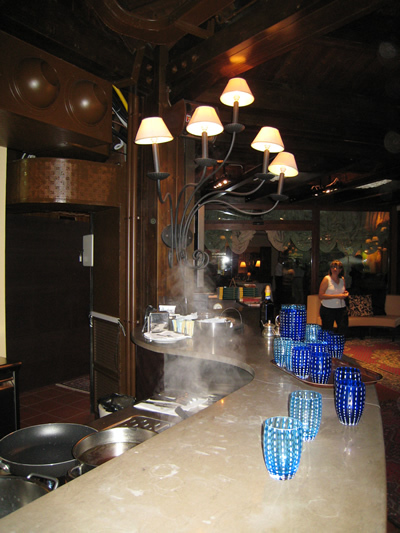 Much of the action at Symposium takes place behind the large, curved bar in the dining room, where patrons are welcome to lean over, watch, and ask questions. 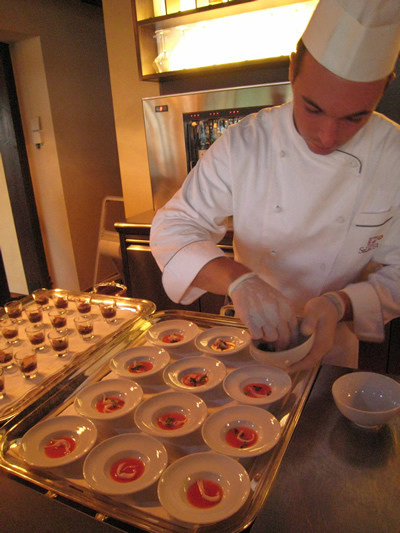 From the time we arrived, Danilo was busy preparing five different nibbles for the aperitivi di benvenuto. 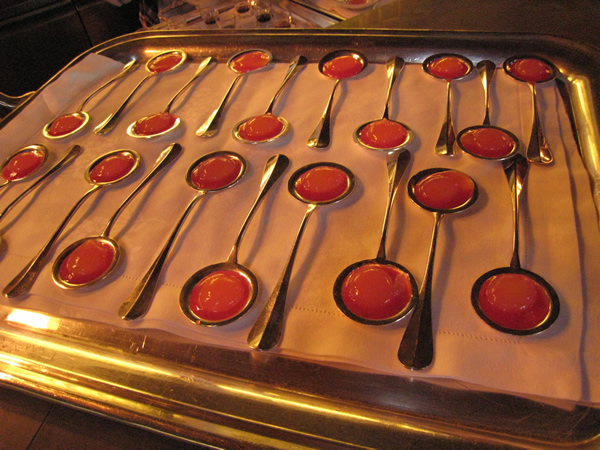 The spoonfuls shown above, designed to be reminiscent of “an American cocktail of the 70s,” were an orange cream enclosed in a liquor-flavored gelatin resting on a strawberry cream. Above you see on the left vetrines containing truffle broth and slivers of sea urchin (the fishiest seafood I have tasted to date). These were later topped with an onion cream. The bowls on the right later contained fried quail’s eggs with an olive topping; I don’t remember what the orange sauce was. Not shown is a vetrine of venison with a watermelon sauce, a most interesting combination of flavors (not so surprising to me – I often serve meat with fruit, though watermelon wouldn’t have occurred to me!). We washed all this down with San Lorenzo’s Franciacorta docg Brut Millesimato 2003 – a nice dry bubbly.